Last year, Deep Baltic ran an extract from the novel This Is Not My Sky by Lithuanian-American author Laima Vincė. She explains a little about its themes below. It is 1950. World War II has ended. But in the tiny Baltic country of Lithuania, which has been occupied by the Soviet Union, the war after the war is still raging. It is an underground war, a war that is fought by the few surviving men left after massive deportations to Siberia, after five years of guerrilla warfare, after a third of the country has fled to the West. It is a war fought by women and children. Maria is 12. Her father is gone. Her mother is hiding a man who is dangerous to the Soviets under the floorboards of the little wooden house on the edge of the forest where they live. This is Maria’s story. It is a coming of age story that spans almost half a century and two continents. It is a story of what happened to so many Baltic people when their countries became the front line for two of the twentieth century’s most ruthless dictators, Stalin and Hitler. This is a story of what it takes to survive in a time when hardly anyone survived. The full novel is now out; this is the first chapter from This Is Not My Sky. Mama bent over the big bed they all slept in and smoothed out the linen blanket. Her long braid fell to her waist. Her face was the shape of a heart. It was an open face, like a daisy’s turned upwards towards the sun. Everyone in Būda said Mama was a beauty. Maria had eyes like Mama’s, eyes as blue as forget-me-nots, the first flowers to bloom in spring. Her little sisters, Vanda and Vilma, had eyes the color of mustard. All three had skin that was pale in winter and turned golden in summer. Vanda and Vilma looked like twins, but they weren’t. Vilma was five and Vanda was eight. Maria was twelve and almost a woman herself. All three sisters had long blond hair that Mama plaited every morning: Vilma’s braids fell just below her shoulders. Maria’s reached her waist, and Vanda’s were about a finger’s length shorter than Maria’s. They had measured. They were all very thin because the war in Lithuania had not ended yet, even though the radio said that the war was over in Europe. Mama shoved the big bed aside, yanked up the rag rug, and pulled up what looked to Maria like part of the floor. Dėdė Rimas’s head emerged from under the floor boards. It looked like Dėdė Rimas’s head was detached from his body—his fine head with his dark brown curly hair and his large blue eyes that were always laughing at them. Vilma and Vanda shrieked, then giggled. But Maria did not like the look of his head emerging from under the floor, as though it had been chopped off and was floating around not attached to a body, like Stalin’s head on the pin Teacher wore on her lapel at school. Then Dėdė Rimas’s upper torso emerged. He swung his legs up and onto the floor and rose to his full height. “Good morning Miss Rose with Two Thorns and Miss Fox and Miss Moon,” he said. Those were the names from the book he read to them in the evenings. The book was called The Little Prince, and the words were written in a language called French. Dėdė Rimas had brought the book with him all the way from France. The book was in his backpack when the airplane dropped him from the sky, just like the Little Prince. “Dėdė Rimas, what are you doing down there?” Vilma shrieked. “I was hiding,” Dėdė Rimas said, as though it were nothing. “Oooh, hide and go seek, can I play too?” Vilma called out. “Of course,” Dėdė Rimas said. “I want to play too!” Vanda shouted. Only Maria didn’t feel so sure. There were chores to do. “Leave our guest alone,” Mama said in her Mama’s voice. “No, it’s alright, I’ll help them with their chores later. We can play now,” Dėdė Rimas said. “Very well,” Mama said, “I will go to my work then.” She left the room. Maria thought it was strange that Mama did not insist they do chores first. Mama always insisted on work first and then play. But since Dėdė Rimas had come to live with them, he had made everything different in the house. “Maria, you count to one hundred and Vilma and Vanda will hide. But you cannot hide in my bunker because that would be too easy,” Dėdė Rimas said, pointing towards the floor, which was now covered again with the rag rug and the bed. Bunker? Why was Dėdė Rimas calling the hole in the floor his bunker? Before Maria could even consider asking, Vilma and Vanda ran off to hide. As always, the heaviest burden fell on Maria because she was twelve and almost a grown-up. Since the Russians had come and taken Tėtė away, she had to help Mama with everything. Vanda was eight and could help a little, but Vilma was only five, and just a baby, and a terrible chatterbox. Maria covered her face with her hands and began to count slowly and evenly: “Vienas,” “du,” “trys”… As she counted, Maria listened to her sisters’ footsteps. Vanda was easy. Maria knew immediately where she would hide. The same place she always hid. She would slide under the bench in the parlor and pull down the linen covering. But with Vilma you never knew what to expect. Maria listened as Vilma trotted back and forth, scurrying between the parlor and the bedroom and the kitchen. Then she heard Vilma whispering, and Dėdė Rimas whispering, and Vilma giggling. He shushed her, and she went silent. Then she heard some rustling. And then it was quiet. Finally, Maria reached a hundred. “Šimtas!” she cried out. Maria took her hands away from her eyes and looked around her. Dėdė Rimas was sitting on the bench, reading The Communist Truth. Mama paid for the newspaper every month so that the people in their village would think she was one of them, but she never read it. She only used it to paper the walls to keep the wind from blowing in through the chinks. All day long Maria would gaze at walls covered with black and white photos of crowds of people carrying large banners, proclaiming that Stalin’s Sun had come to Lithuania. Mama would tell her to hush and give her work to do. That was how it was with Mama. Everything was all confusion. Outside of the house everything was confusion too. 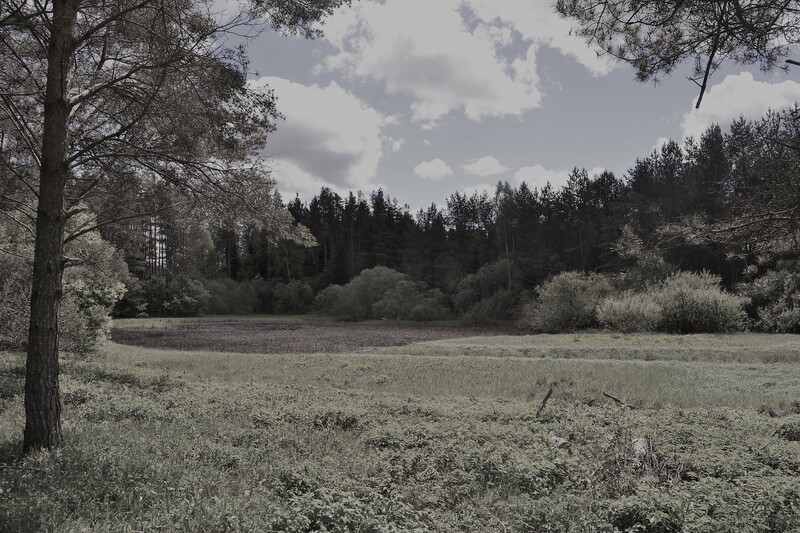 Maria had to remember not to talk about the Forest Brothers, or Dėdė Rimas, or the secret newspapers, or the Americans coming when she was at school, or when she met any of the neighbors in the village or walking the dirt road along the pine forest. Mama told Maria: “Do not love a Forest Brother too much, because within a year he will be dead.” Maria knew that once a Forest Brother was dead, his corpse would be torn up by the Russians, and laid out in front of the church, and everyone in the village would be forced to walk past and look at what was left. The Russians, and the Lithuanians who helped them, would stand and watch to see who shed a tear, and if they saw that tear, then they would take them away. Vanda crawled out from under the bench. She was scowling, but Maria did not pay any attention to her. It was her own fault for always hiding in the same place. Now she only had to find Vilma. Maria felt warm inside from the pleasure of the hunt. First, she searched in the bedroom. She lifted the bed covers. Not in the bed. She looked under the bed. Not there. She opened the wardrobe. Not there. She peeked behind the wardrobe—because you never knew—but Vilma was not there either. She opened Mama’s wooden trunk. Not there. As she was leaving the bedroom, she thought she heard Vilma giggle. Maria hesitated in the doorway. But no, maybe not. In the parlor, she looked under the bench again. No. She looked under the table. No. She looked in the corners. No. Maybe Vilma had become like the Little Prince and magically could become bigger or smaller? Dėdė Rimas was reading The Communist Truth and smirking to himself. He had not left the bench where he was sitting. “Dėdė Rimas, did you see where Vilma is hiding?” Maria asked. Maria ran into the kitchen. She looked in the potato bin. She looked in the pantry. She looked in all four corners. Maria searched the house, but Vilma was nowhere to be found. Maybe the silly girl had fallen into the well? What would Mama say? Maria would be in so much trouble. Suddenly, it was not a game anymore. Vilma was lost. Silence rang out in their little wooden house. “I’ve lost her, I’ve lost her,” Maria cried out. She grew frantic, racing around the house, yanking things from their place. Dėdė Rimas stood up from the bench and walked into the bedroom. Maria followed close behind. Dėdė Rimas went to the wardrobe and reached up. Maria, standing on her tippy toes, strained to see where he was reaching. All she saw were bolts of Mama’s fabric that Mama had woven last winter on her loom. Dėdė Rimas gently lifted one of the bolts and carefully set it down on the floor. He unrolled it and Vilma jumped out. “Big sister, why are you crying?” Vilma asked. “Because I thought I lost you forever,” Maria said, and began to cry harder. “Oh no, Dėdė Rimas is so good at hiding, he hid me the best. When I grow up, I want to be as good at hiding as Dėdė Rimas, so the Russians can’t find me either,” Vilma gushed. A dark look came over Dėdė Rimas’s face. He walked over to the window and carefully pulled up the curtain and peered outside. Mama looked at Dėdė Rimas and a smile crept across her face. “I could always use an extra pair of hands in the kitchen. I have a job for you too,” she said. Dėdė Rimas smiled at Mama. Maria saw that it was a different kind of smile than the smile he gave them. “What’s the job?” he asked. “Is that what my mission has come to?” Dėdė Rimas asked. Mama nodded and giggled. Just like Vilma, Maria thought. Mama went into the pantry and came back with her skirt filled with potatoes. She dumped the potatoes onto the kitchen table and handed Dėdė Rimas a paring knife. Mama picked up her basket of darning and sat down opposite him. She began mending their school stockings. They sat like that for a long time with Dėdė Rimas peeling potatoes and telling jokes and Mama darning. Maria peeled potatoes and handed them to Vanda, who, between peeling her own potatoes, handed them to Vilma, who dropped them with a plop into the tub of water set down on the hard-packed dirt floor. They were very lucky to have potatoes to eat, Maria knew. Somehow Perkūnas had got them an entire sack from the collective farm and had brought it to them. “They say you have been to Paris?” Mama said. Mama dropped her darning and gripped her head with her large work-worn hands, “You’ve been to Paris? And now you’re here?” Mama swayed back and forth on her stool, as though drunk by the thought of a man who had been to Paris sitting in her kitchen. “Tell me about French girls,” Mama asked, and giggled again, just like Vilma. “I never saw any,” Dėdė Rimas said. “I never looked at their legs,” Dėdė Rimas said with a mischievous smile. “Are you married then?” Mama asked. “Ah, but you don’t love your wife,” Mama said. She reached over and swatted Dėdė Rimas’s arm in the same way she would swat a fly in summer. Dėdė Rimas stood and went to the window and gazed outside. Maria had never seen a man cry before. Not even when they took Tėtė away. He did not cry when he said good-bye to them, when the soldiers dragged him out the door and across the yard to the rumbling truck that swallowed him up and took him away forever. But now Dėdė Rimas buried his head in his hands. Mama put down her darning. She stood and went to Dėdė Rimas. Mama wrapped her arms around Dėdė Rimas, as though he were Tėtė, and not Dėdė Rimas. “They are not coming,” Dėdė Rimas said. Dėdė Rimas lifted his head and roared with laughter. He laughed harder and harder, and just like that the tears were gone. Mama turned away and hid her face, but Maria could see that Mama’s cheeks had turned as red as a beet’s. “I meant cocoa,” Dėdė Rimas said, once the laughing fit had passed. “What is cocoa, Mama?” Vilma asked. They stood like that a long time with their arms around each other, and Maria thought it was all very strange because her Tėtė was not there, and because Dėdė Rimas’s wife was somewhere waiting for him in Paris, and here he was with Mama, with his arms wrapped around her, and hers wrapped around him. Maria knew that all the neighbors around them were good, and that if they did see something, they pretended that they hadn’t, all except for one. That neighbor was Teacher. She had come to their village from a city far away and was living in a room in the house on the farm next to theirs. Mama grabbed her woolen shawl from the hook beside the door, tossed it over her thin shoulders, and ran outside into the cold. Through the kitchen window Maria saw Mama chasing the dog across the snowy fields. The faster Mama ran, the faster the dog ran. Maria might have laughed, if she didn’t feel so sad for Dėdė Rimas who had left his beautiful young wife behind in Paris. She might have laughed, if she didn’t feel so sad about her Tėtė who was gone forever. Vanda and Vilma began to fight. Vilma spilled all the potato peelings onto the hard-packed dirt floor. They were cleaning up the peelings from the floor when Mama burst in the door. She leaned against the door frame, struggling to catch her breath. The wind had blown her blond hair out of her long braid. Her face was flushed. Vanda stood and stared blankly. Vilma swirled the potatoes around in the large tub of water and heard nothing. Her arm was submerged up to her elbow. She was happily pushing the potatoes down to the bottom of the tub, and then pulling them back up again, humming to herself. Maria brushed the tears from her eyes. “Yes, Mama,” she whimpered. Dėdė Rimas and Mama rushed into the bedroom. They shoved aside the big bed. Mama yanked up the trapdoor. She took hold of his arm just before he disappeared, “You know what to do,” Mama said. “I know,” Dėdė Rimas said. Mama shut the trapdoor and covered it with the rag rug. Then she shoved the bed on top. Mama ran back into the kitchen. She picked up a potato out of the tub of water and started to peel it, even though there was no skin left to peel. Outside truck engines rumbled, coming closer and closer; then came the voices, ugly voices speaking in Russian. Soon they were pounding on the door. Mama smoothed back her hair and went to the door. She pulled the door open. A man with a red star on his cap shoved Mama aside and stepped inside as though the house belonged to him and not them. “Is there anyone else in this house?” he asked. “Documents!” The Man with the Red Star on his Cap demanded. “Yes, yes, yes,” Mama said. She scurried into the parlor. She pulled open the bureau drawer. She took out a pile of papers and handed them to the Man with the Red Star on his Cap. He ordered her to sit on the bench in the parlor and not to move. He motioned to the men in the truck to come inside. As soon as they were inside the door, they began overturning bins, emptying drawers. They took clothing, dishes, even the potatoes. They shoveled it all into in a large burlap sack they had brought along with them. When the Man with the Red Star on his Cap was finished looking through Mama’s documents, he strolled into the kitchen. Vanda and Vilma were sitting in the corner of the kitchen, huddled near the stove. His eyes rested on Vilma. He walked over to her and took her by the hand. He reached into his jacket pocket and pulled out a hard candy, a sucking candy, and offered it to her. Vilma greedily popped the candy in her mouth. Maria could not remember how long it had been since she or her sisters had tasted a piece of candy. The Man with the Red Star on his Cap led Vilma over to the kitchen table. He sat down and pulled her close. He clamped his knees around her waist, so she could not squirm away. “What’s your favorite game?” he asked in a sweet voice. “Oooh, hide and go seek,” Vilma said. Maria waggled her finger at Vilma to be quiet. The Man with the Red Star on his Cap shot a glance at Maria. An ice-cold shiver ran down her spine. He turned back to Vilma. “Oh, and how do you play that game?” he asked in a gentle voice. “My sisters and I pretend the Russians are coming and we go and hide,” Vilma said. “And where is the best place to hide from these Russians?” he asked. Vilma smiled brightly. “I will show you,” she said. The Man with the Red Star on his Cap glanced at Maria and her face went blank. In school, she had taught herself how to make her face show nothing. Otherwise, Teacher would ask her questions she did not want to answer. Vilma smiled brightly. She was proud of herself. Maria could tell. Mama was sitting in the other room with a soldier guarding her. Vilma took the man’s hand and led him out of the kitchen and into the parlor, and then through the parlor into the bedroom. Maria and Vanda trailed after them. Time was moving slowly now. Maria felt certain she could hear the tick, tick, tick of the bomb below, under the floorboards. It was only a matter of minutes before the bomb exploded, and they would all be dead. Mama thought that Maria did not know about the bomb. But she did. She’d heard when Perkūnas asked Mama if she agreed that if the Russians ever came to their house and found Dėdė Rimas that he would detonate the bomb, and all of them, she, Vilma, Vanda, Mama, would be blown up high into the sky. Mama had agreed. Vilma walked towards their big bed holding the hand of the Man with the Red Star on his Cap. Maria sucked in her breath. “No,” she whispered. The Man with the Red Star on his Cap glanced back at her. A smile spread across his face. Maria glanced quickly at Mama. Mama’s face was as white as milk. Tick, tick, tick went the clock, or was it the bomb ticking under the floorboards? Vilma climbed up onto the bed. She stood on her tippy toes and pointed up at the bolt of fabric Dėdė Rimas had placed on top of the wardrobe. “There, that’s the best place to hide,” Vilma said. The Man with the Red Star on his Cap shouted a command and the soldiers came running. He pointed up at the wardrobe. Two of the soldiers reached up and took the bolt of fabric by both ends, while a third stood with his semi-automatic ready. Gingerly, they lowered the bolt of fabric to the floor, as though the devil himself were about to jump out. Maria heard the click of guns as two more soldiers came up from behind and positioned themselves in the doorway. They were pointing their guns at the weaving. Mama’s most beautiful brown and purple patterned weave with just the slightest hint of green in the background. It would take forever for them to unroll it. Finally, they came to the end. The soldiers stared at the heap of fabric, then looked up, confused, waiting to be told what to do. “You roll yourself up in it and you hide,” Vilma said brightly. She burst into peels of giggles, pleased with herself. The soldiers stared anxiously at the Man with the Red Star on his Cap. They waited for further orders. But the Man with the Red Star on his Cap began to laugh. He laughed quietly at first, and then louder, and louder. The soldiers remained stone-faced, not daring to so much as smile. The Man with the Red Star on his Cap patted Vilma on the head and told her that she was a clever girl for thinking up such a good hiding place. “There’s nothing here and we have enough evidence,” he said, pointing at the burlap bag. Then he turned towards Maria. “And where do you like to hide?” he asked. “And is there anyone else who comes to the house to play hide and seek?” the Man with the Red Star on his Cap asked. “No,” Maria said, her voice barely audible. Mama pulled back the covers and Maria lay down. Her face grew hotter and hotter. The room grew blurry. Mama brought a wet rag and placed it on Maria’s forehead. She lay down beside her and pulled her close. Maria felt warm lying beside Mama. She wished that Mama would stay with her forever, but she knew that there were chores to do, and Mama would have to get up soon. Maria knew how very important it was to have the woman in the village who could say the words to bring the fever down come to them. But they could not bring her over anymore since they began hiding Dėdė Rimas. They could not take the risk. She would have to fight the fever on her own. “I understand, Mama,” Maria said. Maria lay in the warm bed with Mama pressed to her side. Mama stroked Maria’s forehead as though she could pull the fever out of her body with her hands. Maria was glad that Dėdė Rimas had not detonated the bomb when the Man with the Red Star on his Cap came. They had one more day to be alive, and to be together. All she wanted was to live. Oh, how she wanted to live. Laima Vincė is a writer, playwright, poet, and literary translator. She is the recipient of two Fulbright Fellowships and a National Endowment for the Arts grant. Laima Vince has lived and worked in Lithuania for a total of eight years (1988 – 1989, 1995 – 1997, 2007 – 2011) and visits frequently. She is the author of a trilogy of literary nonfiction works about Lithuania: Lenin’s Head on a Platter, The Snake in the Vodka Bottle and Journey into the Backwaters of the Heart. Her play about global issues and immigration, The Interpreter, has been running for three years at the Vilnius Chamber Theatre.